Horses are also used in the treatment of physical and mental problems, whether it be riding them or just being around them. 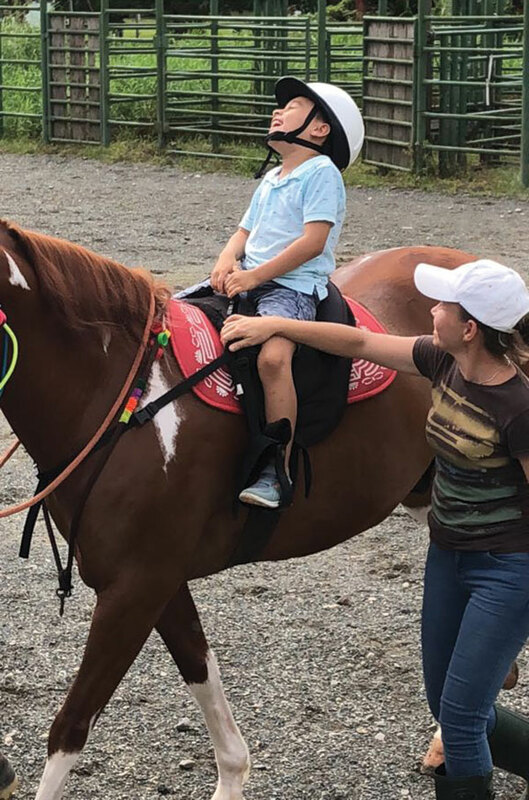 Children with dire problems like cerebral palsy or seizures often find they have better mobility and co-ordination when they ride, which is certainly true for me. I got into trouble as a teen, and because of my background with horses, as my punishment the smart judge sent me to work as a kind of wrangler at a summer camp for kids with serious problems. Well, not only did I learn some much needed humility, I also witnessed how profoundly healing the experience was for these kids and how much it helped them to freely communicate with these so-called ‘dumb’ animals. If you walk into a corral to meet a horse and are anxious or frightened, the horse is not uneasy because of your presence—they recognize who you are inside—the horse is uneasy because they sense that something is scaring you. The therapy part comes in when you have to calm and control your own inner fears and deal with your own problems in order to have a happy relationship with the animal. Veterans returning from their military service often face huge mental and physical issues—often called PTSD, or Post Traumatic Stress Disorder. The U.S. Dept. of Veterans Affairs has recognized and given grants to organizations that treat these problems with horse therapy. Communicating with a horse promotes the skills of emotional awareness and self-control, and decreases the feelings of isolation they have when returning to their regular lives. Horses help restore their trust in other creatures, including humans, and their ability to put aside the absorbing focus on their problems and direct their attention to safe and caring interaction. One of my riding buddies in Colorado hosts healing sessions with horses, sometimes using what is called the Equine Gestalt Coaching Method. Gestalt therapy was developed in the 1940s, and it is still an experimental and a humanistic form of therapy. Gestalt is grounded in the belief that people are innately good—that we are driven by good intentions, morality and ethical values. Proponents of the use of horses in this type of therapy claim that horses help teach self-awareness, trust in intuition, and can illuminate our patterns of contact, allowing us to receive direct and immediate feedback from the horse about our intentions, behavior and incongruities. The horse is kind of a metaphor—a way of dealing with our fears and helping us to heal. Now I am an old-school horsewoman with no academic credentials or the vocabulary to discuss psychology and such, but all this rings true to me. Horses CAN help us unravel our problems and deal with them—I know this from a lifetime of being helped by them and by watching others benefit from being around them. 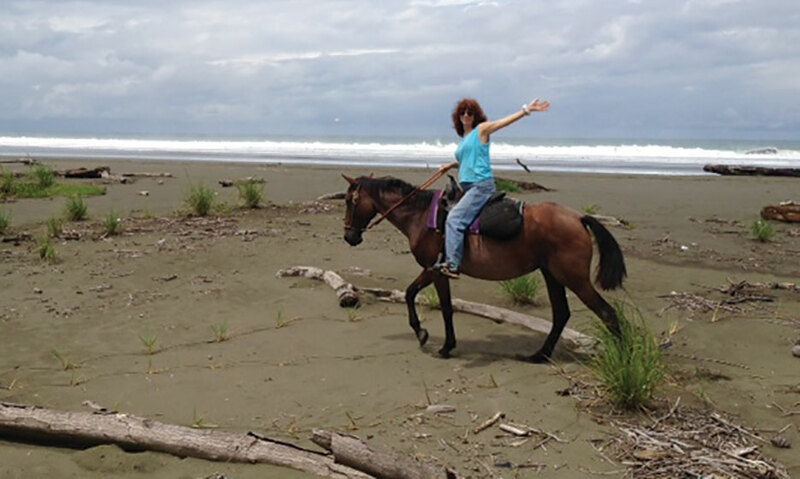 I recently learned about a great organization here in Quepos called APAQ (Asociation de Personas con Autismo) from my friends at Islas of Manuel Antonio, who sponsored a years’ worth of horse therapy for 21 kids with autism. 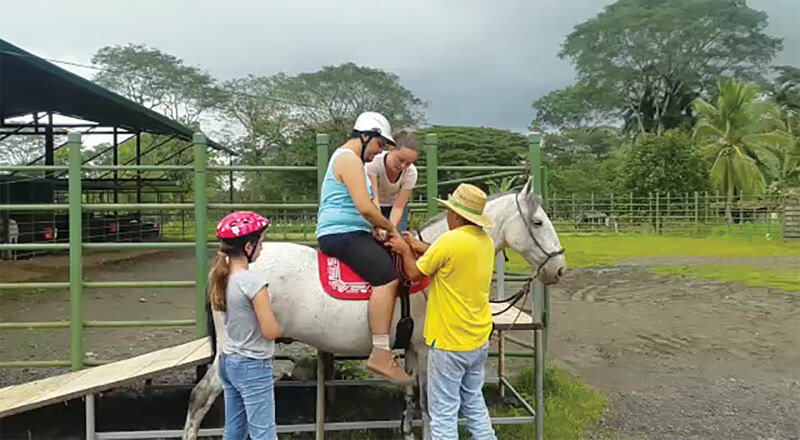 This program was started 3 years ago and they provide a safe environment and trained staff to give people with this difficult condition time outdoors with horses, where they can learn to care for the animals and where they can benefit from the physical and emotional interaction they have with them. It is a fine organization—check it out at facebook.com/APAQuepos. So now we have humans benefiting from horse and music therapy and horses occasionally benefiting from music therapy! When I was a kid we would keep a radio in the barn tuned to a classical or country music station, having noticed (without the aid of any scientists or academic validation) that horses are more alert but calmer when there was soft music being played. Human hearing ranges from 20 Hz to 21,000 Hz, while horses recognize sounds from 55 Hz to 33,500 Hz. There are composers nowadays who write music geared to horses—modifying the tones and frequencies and placing them in the audio comfort zone of horses, with the result of less anxious behavior. For us humans there are videos produced nowadays made with organic sounds and new age type music accompanying the film footage, which is usually lovely scenes of wild horses running free, foals in lush green grass, and pristine babbling brooks with horses splashing through them. Beautiful to watch and soothing to listen to. My only problem with these are that the horses look a bit unkempt—since they are wild they don’t regularly get pedicures or their manes and tails shampooed. I can’t help it that I have an urge to groom them, but their natural communal freedom is inspiring and liberating. However, even that is a bit misleading, as the current administration in Washington is determined to open up their protected habitat to hunters and other industries and these noble animals are facing a horrible fenced-in future. 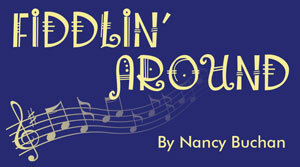 This column started out to be about the songs that describe the thrill of riding a good horse down a shady lane, or the 8 seconds of glory on a saddle bronc at the local rodeo or the sad songs about a lonesome night where your horse is your only friend. Sentimental stuff that I know about. But somewhere that train ran off the track. Oops. There are plenty of songs that involve horses, sometimes telling a story, sometimes using them to explain elusive concepts, and many times just to rejoice in the cowgirl/cowboy life style and the knowledge and pleasure that come from being around these wonderful animals. I’m personally pretty darn glad that music and horses have occupied such a large part of my life, and I am happiest when I am riding a horse, lost somewhere in nature, singing my favorite Willie Nelson song. Who, by the way, quietly helps fund the fight to save wild horses from extinction. Thanks to you folks who contributed to the young musician I wrote about last month (Gary Sancho Esquivel) who is raising money to match the music scholarship he received from a college in the states. Check out his audition and info at PayPal—gogetfunding.com/un-musico-costarricense-necesita-tu-ayuda. Send some money to him if you can—be part of making his dream come true. As the rains subside and the intrepid travelers come back to town, there will be more options to hear live music, so come on out and have some fun with us! It’s good therapy! I’m gonna saddle up and go for a ride on the beach with my sweet pal Tigre. Happy trails to you….